In this file photo from 2016, H.E. 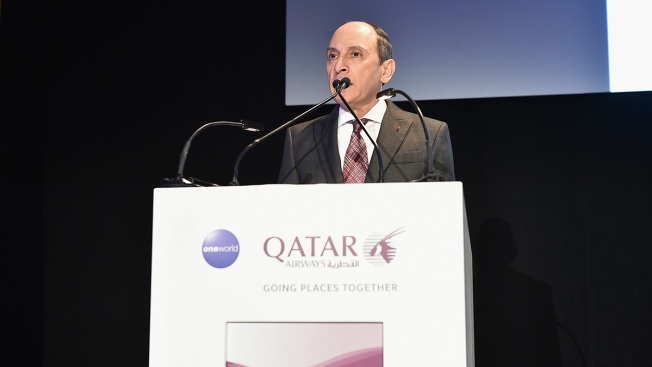 Akbar Al Baker attends a Qatar Airways event in Atlanta, Georgia. The CEO of Qatar Airways apologized Wednesday for suggesting at an aviation meeting that men have to lead companies. He said “of course it has to be led by a man, because it is a very challenging position,” according to The New York Times. Al Baker initially said the comment was a joke, according to the report, but offered “heartfelt apologies” in a statement. The CEO of Qatar Airways apologized Wednesday for suggesting at an aviation meeting a day earlier that men have to lead companies in order for them to be effective. When reporters asked Akbar Al Baker about airline gender inequality throughout the Middle East, Al Baker remarked that inequality wasn’t prevalent at his airline but that “of course it has to be led by a man, because it is a very challenging position,” according to The New York Times. Al Baker initially said the comment was a joke, according to the report, but offered “heartfelt apologies” in a statement after his remarks were criticized on social media. He said in the statement that about 44 percent of the company’s employees are women. “Qatar Airways firmly believes in gender equality in the workplace and our airline has been a pioneer in our region in this regard, as the first airline to employ female pilots, as one of the first to train and employ female engineers, and with females represented through to Senior Vice President positions within the airline reporting directly to me,” Al Baker said in the statement. Al Baker was recently named the chaiman of the International Air Transport Association’s board of governors. This wasn’t the first time Al Baker made headlines over sexist comments. In 2017, he called flight attendants on U.S. airlines “grandmothers,” according to Bloomberg. He later apologized.